By the fourth year together, you better be ready for a commitment. At that point, you’re out of options. At 27 years old, this was explained to me subtly by my girlfriend …. OK, subtly might be a little generous. She was not known for her subtlety. To be fair, she was from Philly. And I’m a Minnesota guy. So subtlety was neither going to find the seed nor the fertile ground to thrive. And that worked for us. Let’s try that sentence again. At 27 years old, this was explained to me demonstratively by my girlfriend in the fourth year of our relationship. During the first year we barely saw each other, both of us clumsily falling into a long-distance relationship. The second year I moved to Philly and we navigated those life-changing rapids. The third year we drifted lazily down life’s river. And then the fourth year came and all hell broke loose. Because I was out of options. A commitment needed to be made, or she was going to be gone. I had a decision to make. Baseball options work the same way. A team has three seasons to make up its mind. If it doesn’t commit by the fourth, the player is going to be gone. The Twins have a decision to make. Once a player is put on the 40-man roster (dating), the ballclub can only keep him off of the 25-man roster (marriage) for three seasons. It doesn’t matter how many times that person is added to or taken off of the 25-man roster during that season – the whole season is an option. So a player can be sent up and down multiple times during the season and it’s still one option. Or they can spend the entire season in the minors, and that’s also one option. The critical point is that they spend some time during that season not on the 25-man roster. However, unlike our analogy above, those three seasons don’t need to be consecutive. Francisco Liriano would be a good example. Liriano was with the major league club all of last year; he never was sent back to the minors and so he didn’t cost the team an option. Even though he’s been on the 40-man roster for three seasons, he still has options, because the Twins didn’t send him down to the minors during some of those years. It would be like if I went overseas. That likely wouldn’t have counted as a year in our relationship. Though she might not have agreed. 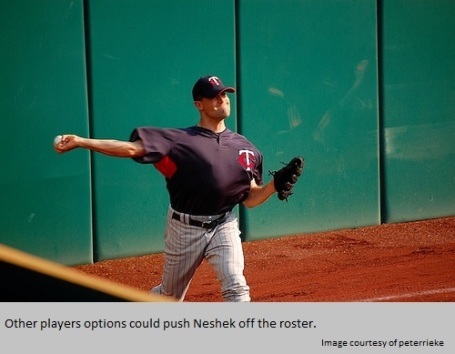 Options are something that major league teams consider as they break spring training. A player who doesn’t make the roster and is out of options can be claimed by another team which has space on its 25-man roster. She finds somebody else who is a little more willing to make a commitment. Fortunately, this year the Twins only have a few decisions to make. Last year’s make-or-break season for Alexi Casilla broke. 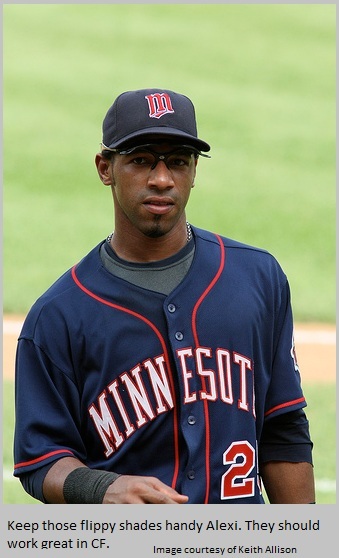 But he’s still the best middle infield prospect in the Twins system, and with Orlando Hudson only signed for one year, the Twins would sure like to keep him around for 2011. But he’s out of options. The only way to keep him is to put him on the 25-man roster. That leaves only the 25th spot – maybe – for Casilla. Or manager Ron Gardenhire could decide that he feels comfortable with Punto or Casilla as backup centerfielder (because he’s SO tolerant of questionable defense). My advice to Casilla is: get some time in centerfield during spring training. Major league, split squad, minor league – whatever it takes. He really needs to show that he can handle that spot. For that matter Alexi, you might want to consider getting to camp early. Criminy! Are you really one of the four guys not there yet? You’re battling for the 25th roster spot and you’re not there yet? Savvy. On second thought, it might not be the biggest loss to lose Alexi. 6. Condrey (who is out of options). - Anthony Swarzak and Jeff Manship – two starting pitchers from last year who could probably use a little more time in the minors. If Casilla gets the 25th spot (and everyone remains healthy), none of those guys make the team, despite having significant roles in previous years. The good news is that all of those pitchers have options. The Twins can stash them in Rochester for a midseason call-up or to take the place of pitchers who leave at the end of the year. So the Twins are in a better position than I was with my girlfriend. I also had a decision to make. So I went on a summer trip, had an experience that deserves its own column (where it can be used as an overreaching baseball analogy), and married her four years to the day after we met. In two more months, The Voice of Reason™ and I will have stretched that to twenty years. - And I wrote about the Twins biggest rivals yesterday, will be tweeting today, and will recall the greatest version of the Hormel Row of Fame song ever played tomorrow. I hope you can stop by again then.